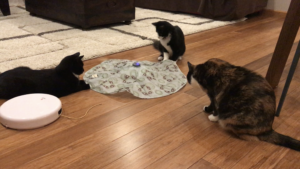 We’re a home made up of three kitties and two humans, reviewing cat products (toys, furniture, etc.) for you. It’s the pleasure of our three kitties, Tinkerbell, Tidbit and Gherkin, to give their unbiased and finicky opinions! 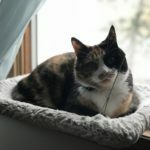 We’re talking food, cat toys, books, catnip and general cat lifestyle topics that you’d expect on a cat blog! Have a topic idea or a general cat question? 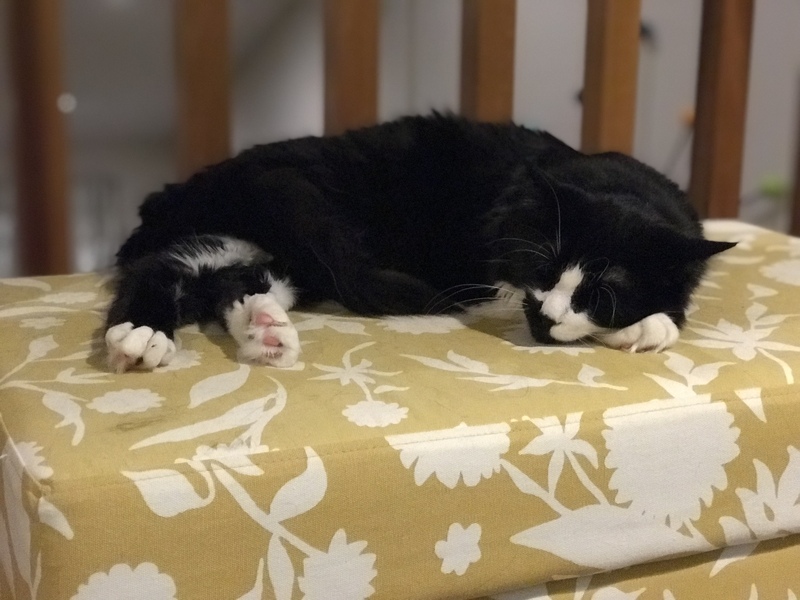 Do you have the most adorable picture of your kitty? Whatever it is, share it with us on Facebook. Check out the shop and find the purrfect collar for your kitty! 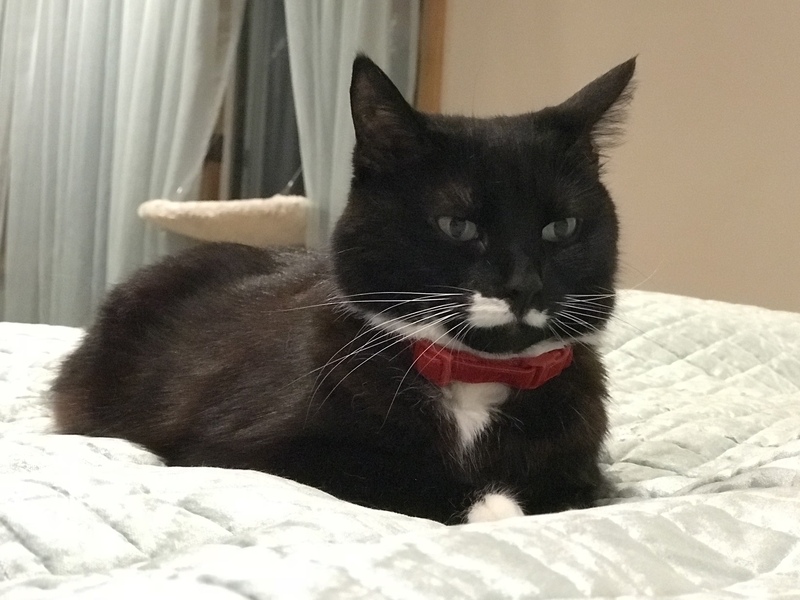 Be sure to share a picture of your kitty in their Swanky Kitty collar! The first thing others notice about me is that I’m very laid back, likely asleep at any given time. So laid back that I don’t wake up for loud noises or interruptions of any kind and sometimes not even for mealtime. I’ve been like this my whole life. I know what you’re thinking, this sounds like I’m a catnip addict. Although I am a catnip enthusiast, it actually makes me feisty. 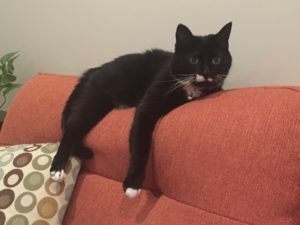 I am just naturally more laid back than the average house cat. I am an indoor cat but I do enjoy the outdoors and try to get out at every opportunity. I often get outside and make a run for it and lay down under the neighbor’s deck where no one can get me. This is why I have a custom made harness and leash that is sometimes imposed upon me. Being outside automatically puts me in a good mood and makes me purr. When I’m not running away, I like to graze on grass like a cow in a pasture. Other things I enjoy are the occasional game of laser or string but mostly I like to watch TV and snuggle under the covers. I invented Netflix-and-chill. My favorite shows are Friends, I Dream Of Jeannie and Gracie and Frankie. scratching the furniture to make a point, giving kisses, playing with packing paper, laying in front of heat vents, bathing in the sun, my red velvet collar, big dogs (probably from my early days of living as a barn cat and being co parented by a golden retriever) and chin scratches. My dislikes are baths, fish oil added to my wet food (it’s good for my shiny coat and dry skin in the winter), loud noises, small dogs that bark a lot and going to the vet. One thing I wish people noticed about me is that I am a sweetheart. People often don’t see this side of me as I am very weary of some strangers, it’s really hit or miss with no rhyme or reason, but I like those with stinky feet the best and sometimes fall asleep with my head in their shoes. The smellier the better. Seriously. If you hang out with me, expect an extremely well mannered, delicate, laid back couch potato. I may beg for your food, mostly bacon, cheese and smoked turkey but I’ll do it in the cutest, sweetest way possible. We all know that drinking water is essential not just for us but for our best fur friends as well. Pets should have clean water available to them at all times. When I first brought Tinkerbell home, I made sure she had a dish for food and a dish for water. As time went on and we added another kitty to the lineup, I thought maybe there was a better way. After reading that cats are attracted to moving water because in nature stagnant water could harbor parasites and bacteria. 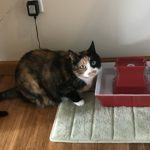 This is the reason water fountains encourage increased water intake and why I ventured down the rabbit hole of looking into water fountains for cats. Just a few things to keep in mind with all fountains. First, they all require regular cleaning that takes a little more time and effort than just a regular bowl. There are usually a couple pieces that come apart to be cleaned and then have to be put back together. The second thing is that all of the fountains I’ve seen have a filter or two. All of the below fountain have a charcoal filter that needs to be replaced regularly and some included a foam filter that can be cleaned are reused. With that said, let’s discuss actual fountains. The first water fountain I bought was fairly inexpensive and made of plastic. I think I spent around $30 and ended up returning it at least twice before returning it for good. The pump was extremely loud and it generally didn’t do a great job. Additionally, I don’t like drinking out of plastic, so why should my cats? The second fountain I bought was a much nicer fountain. 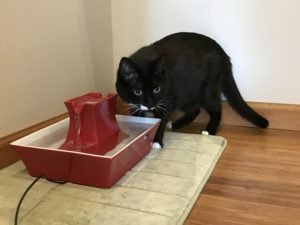 I opted for the Petsafe Pagoda fountain which is made of ceramic, a larger size and a nice quiet pump. This includes a charcoal filter and foam filter around the pump. This setup is pretty straight forward and easy to clean. I have also found the water pump online, so if need be, the only wearable part would be easily replaceable, which is a bonus. Overall, the maintenance on this (filters, pump if needed) is fairly low cost so I expect this fountain to last a long time with minimal additional cost. The third fountain was the American Valley Nature Spa fountain. I saw this advertised somewhere and thought it looked nifty. This one had a separate reservoir to keep the fountain full and claimed to have UV purification. It looked cool with the blue light and the sound of the water was very soothing. After using this for a while, I took it apart and found it extremely difficult, essentially impossible, to clean and the UV purification (which I think is just an LED light) didn’t seem to help keep the internal tubing clean, that is inaccessible. When we added Gherkin to our family, our third cat, the fountain just seemed to always be empty, despite opting for the larger reservoir. Also, Tidbit would knock the reservoir off or into the fountain and end up getting water everywhere. This fountain seemed like a great idea but for several reasons but just isn’t practical for us. In the end, I went back to our Petsafe Pagoda contain for a few reasons. I like that it was made out of ceramic, versus plastic. The fountain itself held a good amount of water and was relatively easy to clean, which was ultimately the deciding factor. The fountain is just simple and straight forward to use and clean. Of course the kitties all like it and continue to drink lots of water and dip their paws in the stream now and then. 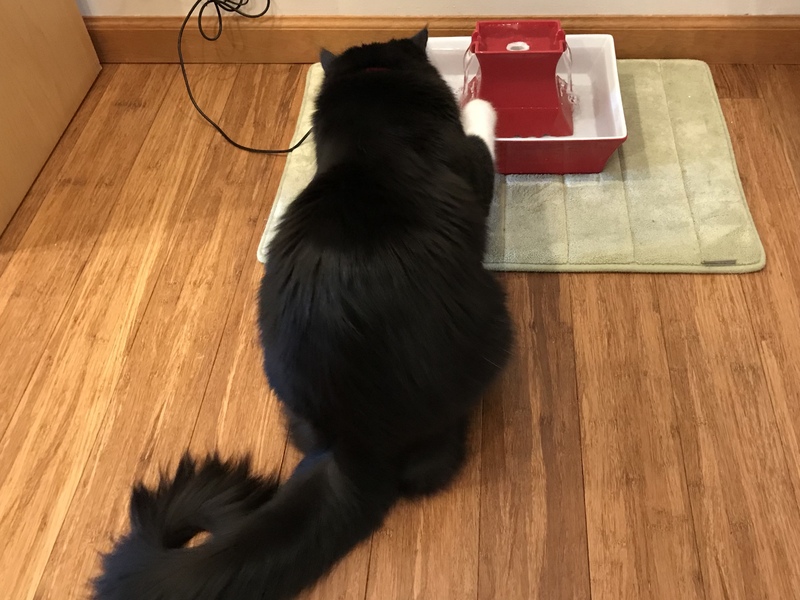 The Pagoda cost a little more upfront but is worth it in convenience and knowing that I am able to give the whole fountain a good cleaning ensuring my kitties have fresh water, was ultimately the deciding factor. I am a cat lover, no question about that. I love my cats, however, when we brought home our sweet little Gherkin, we had no idea what we were really in for. Perhaps it’s because it had been 6 years since we had a kitten or maybe it was because he had more energy than a nuclear power plant. Seemingly, the only way to cope was to have a few toys for an energetic cat. Mind you, I played and snuggled with Gherkin a LOT because he’s a kitten (and because that’s just what I do with kitties) and needs the extra love and attention. Since I have a job, I can’t be with him all day, every day so I had to find some solutions to his endless amounts of energy. This is how I dealt with an energetic little boy. Go Cat Teaser Wand – Our cats have had all sorts of teaser wands, feathers, plush, etc. The kitty crew will play with them all but there is something about what’s at the end of this teaser wand. There are a couples options; a bee or mouse and my cats love both. They will play with the bee all by itself. This is by far their favorite teaser wand! Window Perch – This is great for even the laziest of cats. All three of the cats thoroughly enjoy lounging on the cat perch. They also like sitting on it to watch the birds or whatever else it is that they watch outside. If you have the window space, you have to get one of these! Feeder Ball – This is less of a toy and an interactive way to feed your cat. This also slows your cat down from gobbling up food, so this too would be good for a larger or lazier cat. The ball has a removable lid which makes it easy to fill with food. The outside of the ball has holes that can be adjusted for the kibble size and to adjust the level of difficulty for your cat. 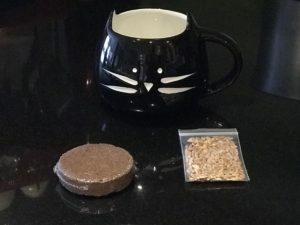 I advise making the feeder ball as easy as possible for the first few go arounds and increase the difficulty after your kitty has the hang of it. Kick Stick – I was hesitant about this one but I gave it a try and bought a few kick sticks. Their favorite kick stick, that gets a lot of attention, is a large durable denim kick stick with a pocket for catnip. We tried microfiber and plush but it’s this denim kick stick that won them over. Try different materials and see what works best for your kitties. 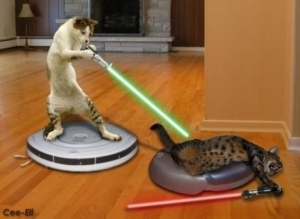 Interactive Laser – Again, this is like playing laser with your cat without having to actually be there to play laser. Hit the button, the laser turns on and after a while it automatically shuts off. It also requires batteries but, they last a while. Interactive Butterfly – Another automated toy that has the appeal of a fluttering butterfly going around in circles. 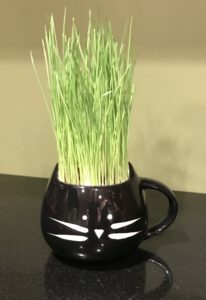 This one is pretty engaging and fun to watch the kitties play with it. This model is nice because the base is wide enough that they can’t tip it over and you can turn it on with the tap of your toe. This toy doesn’t shut off on it’s own so you’ll have to stick around to turn it back off. Mystery motion toy – This is a cute toy but you’ll need a hard surface, it won’t work as well (if at all) on carpet. It has an arm with a feather at the end that rolls around under a piece of fabric, using random motions. 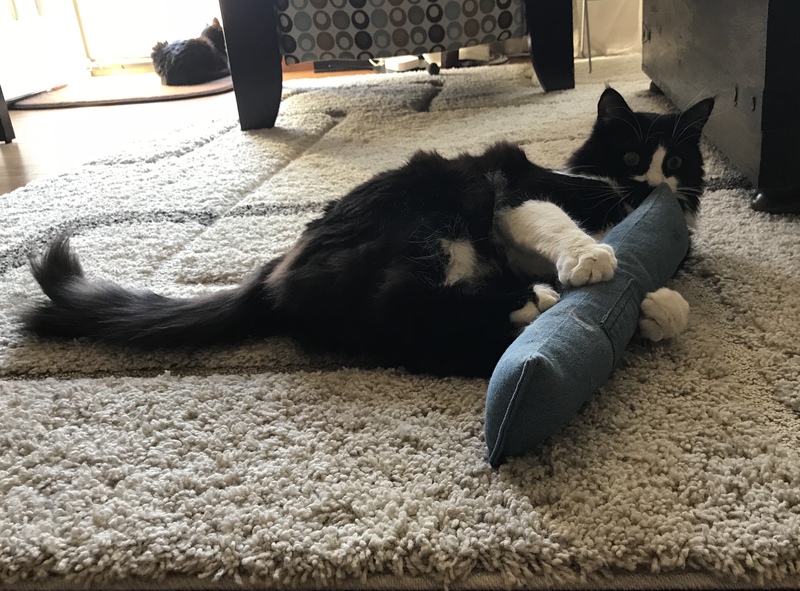 When Gherkin was a kitten he loved this toy so much that as soon as we woke up in the morning, he would run over to the toy and start crying until we turned it on. It’s still a big hit to this day. Yet another toy that could use an auto shut off feature but until they improve it, I will have to deal with it. Flik Automatic Teaser – This is essentially like playing string with your cat minus the human element. Most important, the cat actually plays with it! You turn the toy on and the string flicks out at random times and has an automatic shutoff. It requires batteries but they last a while so it’s worth it. This is one of our favorites! As you can tell, my strategy is play as much as you can and in between distract, distract, distract! I also rotate all their toys and put them away for a little while before bringing the toy back out for play. This helps prevent boredom with any one toy. Occasionally, in my spare time I enjoy a little knitting and might make myself or my husband a scarf or hat. My grandmother taught me to crochet when I was young and then a little later taught me to knit. (Her first attempt at teaching me to knit was a total failure because I just wasn’t catching on!) I am by no means nimble with yarn and patterns are like reading Greek for me. I can count on my hands the number of things I’ve ever knitted or crocheted. 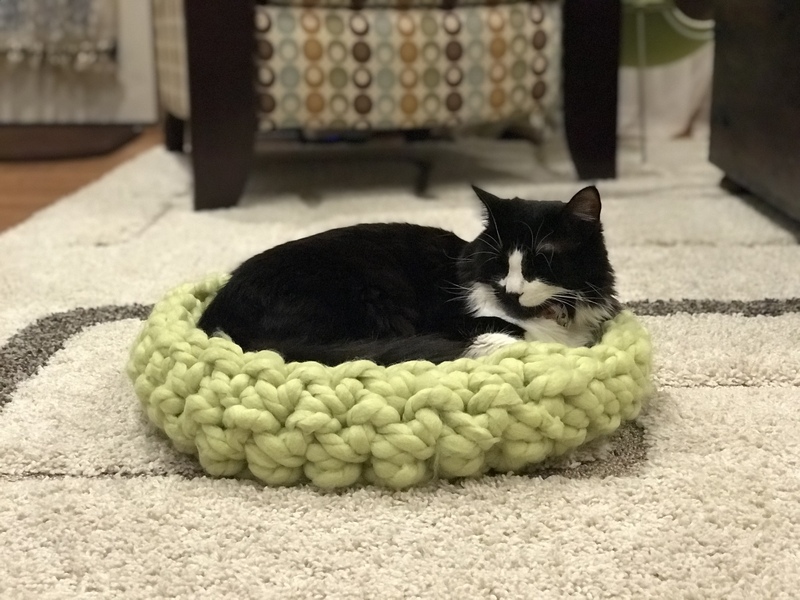 With that said, every time I go to the craft store I see the over sized yarn and think ‘it’s so cool, what could I ever do with that?’ Then I saw a cat bed made from jumbo yarn, I had to make one too! I watched a number of YouTube videos and settled on this video. The woman in the video is thorough and goes at a good pace. Don’t feel bad about watching and re-watching the video, I did too! I used two bundles of this yarn. This is “arm crocheting” so no additional crocheting tools are needed. I also used a binder clip to keep track of my beginning stitch, I found this extremely helpful in minimizing the confusion. Ultimately, below is the “pattern” (using the term loosely since I can’t read patterns, I certainly don’t know how to write one) I used, consider them my notes, after using the video as a guide. I made the bed larger to accommodate my bigger kitty, ~13lbs and possibly still growing. 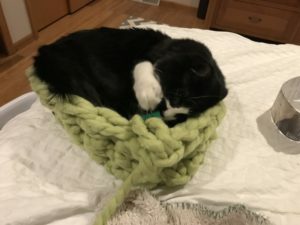 The first version of the bed was way too small for Gherkin, luckily this is easy to unravel and try again. 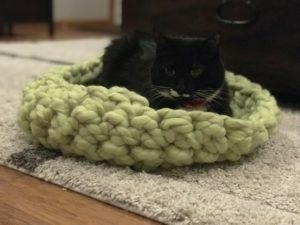 Last thing anyone wants is a cat bed that no one can fit in! The whole bed took maybe 45 minutes and that includes starting over once to make the bed larger. Once it was done, Gherkin could not wait to hop in and do what kitties do best, take a nap! Tinkerbell and Tidbit also enjoyed the new nap spot! For most of us holidays are filled with the hustle and bustle of trying to see all your family, shopping, eating, drinking and generally being merry or at least giving it your best shot! It starts on Thanksgiving, maybe even the day before for some, and the holiday marathon goes straight through until New Year’s Day recovery. With the hustle and bustle aside, let’s talk about Giving Tuesday. I personally like the holidays, I love seeing all the lights and decorations and I appreciate getting into the spirit of things with holiday activities and a few traditions. Most of the time I don’t even mind shopping. This year I think my favorite activity will be participating in Giving Tuesday. Although Swanky Kitty donates a portion of proceeds all year round, I will be participating in Giving Tuesday as well. There are a number of organizations that I wholeheartedly believe in. I wanted to specifically mention the organizations that Swanky Kitty supports. This year I am choosing HEART Animal Rescue because they gave us our little Gherkin! What a great job they did raising this little boy until we were able to give him his forever home. These are all great organizations and I hope you too participate in Giving Tuesday! To that I would had to admit defeat. They seem to be trained when they hear the refrigerator open or the crack of the cat food can opening but other than that I struggled with some ongoing behavioral issues. Tinkerbell, my first and fabulous kitty (and you’ll notice, my sole problem child) had a bag of tricks that I couldn’t break her of. Some of her favorite antics: scratching the couch and walking on the counters despite knowing only she found this acceptable. 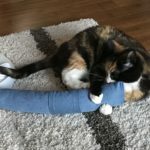 After YEARS of cohabiting with my furry darlings, I have pain painstakingly tried a number of behavior modification tactics. Repetition. Where I say “no” (without yelling because that apparently hurts a cat’s ego and makes them act out more) and to stop the unwanted behavior. Result: A LOT of effort on my part, not a lot of results. Water bottle. After sweet, sweet Tinkerbell was well on her way to destroying couch #1, I tried spraying her with water. Result: This worked exactly three times, after that she sat there and let me spray her with water. There was also the constant worry that I may accidentally spray her face or eyes. Deterrent sprays. There are products out there that use scents to deter cats from scratching your furniture. I sprayed this on my couch. Result: Money wasted. Tin foil. 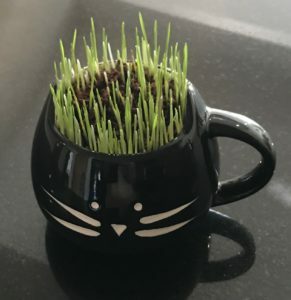 This was used to keep adorable Tinkerbell from walking on the counter. I would line the edge of the counter with foil. Result: She would jump over the tin foiled area. So unless I was willing to live in a tin foil kitchen, this was not helping anything. Loud Noises. I read that making loud noises will act as a deterrent. Result: You can’t believe everything you read. 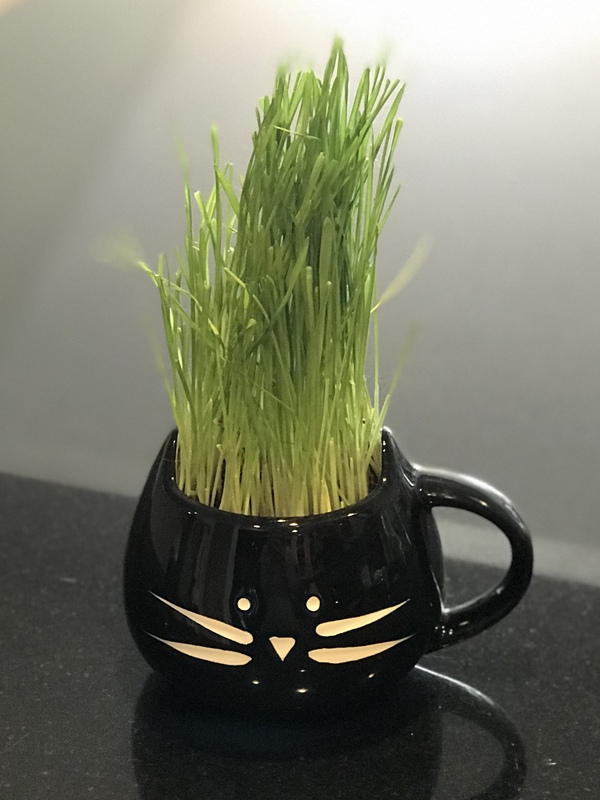 Then one day, while I was at work, on the phone with a coworker whose spouse is an animal behaviorist, she tells me that there is a gadget that is motion activated and will give out a puff of air when the cat jumps on the counter. This supposedly scares the cat. I think, is it really that simple? My cats do not like when I clean my keyboard or my husband lets air out of his bicycle tire. Will a regular can of air work? Can of air. Whenever my kitties are acting out, I pick up a can of air and shoot air into… well, the air. Result: They immediately stop, drop and disperse. This has been a life changer in our house. I can use this tactic regardless of behavior, scratching, counter walking, in fighting and not worry about shooting water at their eyes, all my furniture smelling weird or covering all exposed surfaces in foil. I don’t have to yell or be disruptive or rush over to stop them, I just calmly pick up a can of air (which I have a half dozen strategically placed throughout the house) and press the nozzle. It has become so effective that most of the time I just pick up the can and they stop, proving that you can, after all, train a cat. 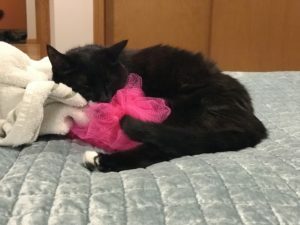 Let’s talk cat fur management, often a losing battle! Luckily, I found it in the form of the Roomba! At first, I hesitated to buy a “gadget” that vacuums my house at the touch of a button. Luckily, we have wonderful neighbors that not only lend us a cup of sugar when we need it but let us take home and test drive their Roomba, who they’ve named “Sonny”, for a week. It may be true that we kept “him” for longer but that is unconfirmed. Cat In The Hole; A Cat Door For Everyone! When we recently moved into our new home and we knew that we wanted to put the litter boxes in the basement. Not that we don’t love our furry girls, we just don’t love seeing the boxes, plus they get a little added privacy while doing their business (and who doesn’t want their privacy). The new house has a door at the top of the basement stairs and obviously, our kitties (usually) can’t open doors for themselves, despite their best efforts (if they could, then I’d be writing a different story!). I scoured the web for a solution finding a plethora of exterior pet doors. Finally, I found the cat door by Cathole. Reviews on a few websites only sang praises for this product, so I immediately added it to my online cart and within a few days, it was at my door. 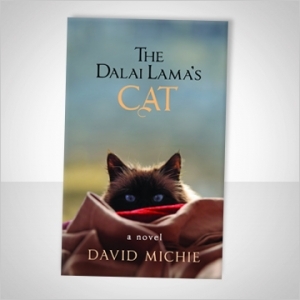 Continue reading Cat In The Hole; A Cat Door For Everyone!